Be like the cool kids! Savvy in Notting Hill, knowing when the hip beats of the city's clubs are calling and meeting up with the in-crowd. “Lizzy – London” knows all the hot spots in this city, knows what is in tomorrow and presents it today. Whether taking a walk in Hyde Park or out in Covent Garden, seeing and being seen comes easily to “Lizzy – London”. Life is beautiful in colour. Tea time? Yes, of course, because “Lizzy’s” style is both very British and excitingly new – and combines this to make surprising interior trends. Design is simply being. 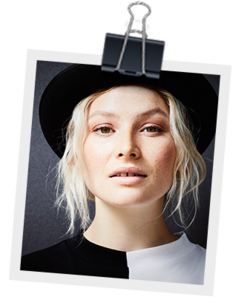 The typical character “Lizzy” represents the trends from the metropolis of London. “Lizzy” does not care much for rules, monotony or routine. The more colourful and unusual, the better! This is reflected on her walls, which are dressed in a Baroque pattern in a cheeky dark red with glittering details. An eye-catcher for anyone who enters her little kingdom in Kensington. The same goes for her wallpaper with its modern graphic design, which of course also has glitter. You must be asking yourself: “Hm ... baroque and graphic patterns? These are two completely different styles...” Exactly! That is exactly the essence of London's special charm – a combination of old and new. You will see an old Victorian building from the outside and the latest, hottest interior trends await you inside. It never gets boring here! Let's see what else we can show you in the near future. It will definitely be exciting! It's like love at first sight – the geometric-patterned wallpapers of “Lizzy – London” are not only fascinating with sparkling glitter details, they also impress with their colourfulness. Imagine you come home from work after a stressful day and just want to relax. First, you enter the apartment and throw your keys in a bowl on your natural wood chest of drawers in the hallway – this is backed by the shimmering modern geometric wallpaper, which has a comforting effect due to its look and texture. With a smile and a chilled pint in your hand that you’ve just fetched from the kitchen, you step towards the living room and make yourself comfortable on your well-used leather sofa. 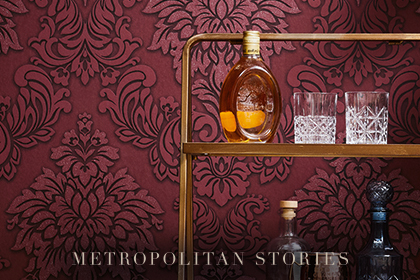 Your gaze sweeps through the room and you enjoy your dark red, velvety-looking Baroque wallpaper, which really shows off your mini bar. There's only one thing left to say – cheers! The baroque pattern with ornaments is captivating both for its pattern and its colour, ranging from the more solid beige to rich red or impressive black. A striking shimmer effect truly makes a feature of these wallpapers.